Wanna juice? You cannot just buy a juicer. There are juicers that specialize in soft berries, others that focus on harder veggies and even some models for citruses. Learn about the differences between centrifugal and masticating juicers and find out about the latest juicing features. 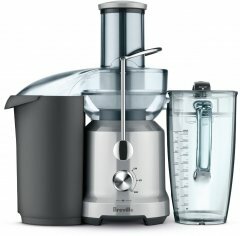 As of April 2019, the best juicer 2019 is the Breville BCP600SIL, while the second best model is the Omega NC900HDC Nutrition System. 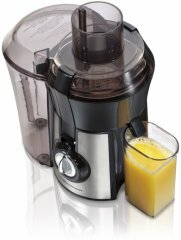 Here is the full top 10 list, then special categories and a full list of juicer brands and models. 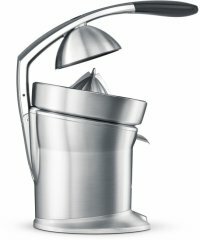 Given its compound ranking of 91%, we conclude that the Breville BCP600SIL is, as of now, Alphachooser's best juicer 2019. Alphachooser also concludes that our sample of 110 reviews from our sources gives us a high confidence level (more on confidence levels) that prompts us to name it a "no-brainer best choice." 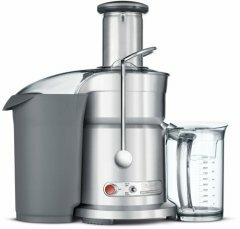 With its 4.5 stars averaged from 460 reviews, here is second best juicer. * This choice (and the following members of this best juicer models list), is based on a full analysis of hundreds of juicer reviews from across the web. 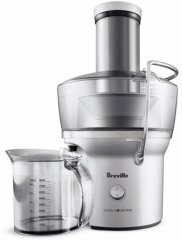 Our picture shows the Breville Juice Fountain Cold. Our picture shows the Hamilton Beach 67750. Our illustration shows the Kuvings NJE-3530U. Our illustration shows the Juiceman JM850. An 85-watt citrus juicer with a button-less start/stop feature. Twin-gear 160RPM green juicer with bio-magnetic and ceramic technology and a 10-year warranty. Inexpensive and simple citrus juicer operated by a 70-watt motor with a one-year warranty. 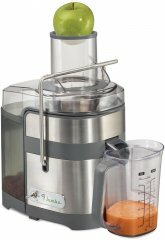 Basic centrifugal juicer powered by a 400-watt motor, backed by a 2-year warranty and featuring a special pulp-adjustment control. Slow masticating juice extractor with an induction motor that produces only 38 decibels and a BPA-free single auger. Classic juicer with a see-through body, a bundled personal blender called Booster and a 60-day warrany. Safety-oriented twin-gear juicer that comes with a hefty price and anti-jam features, such as auto-reverse and self-adjusting speed control. Cold press (also known as masticating) juicer with a 40RPM juicing speed, a 7-year warranty, and Juicepresso's 3-in-1 Smart Extraction System.